It takes some people the better part of a lifetime to figure out what type of lasting mark they want to make on the world. Twelve-year-old Fredrick Spanabel seems to be ahead of the curve. Fredrick has a heart for animals and a mind for business. In his family's Hazel Park shed row, you can find Finn B Cool, who is Fredrick's racehorse (with “Fredrick Ryan Spanabel” listed as the owner) among his father's 25 horses in training. You can also find a menagerie of other animals, including pigeons, chickens, rabbits and a raccoon, in Fredrick's makeshift animal rescue and rehabilitation area. While Fredrick is saving most of the earnings from Finn B Cool and any other horse he owns for his future college expenses, exceptions are made when a situation warrants it, as was the case on July 2nd. With his dad listed as the trainer, Fredrick claimed 12-year-old Good Credentials with the sole intention of permanently retiring him from racing. Bred in Kentucky by Pin Oak Stud, Good Credentials spent his career in the claiming ranks at tracks like Evangeline, Hawthorne and Thistledown and made an honest living, retiring at age 7 with a record of 56-5-12-8 and earnings of $47,402. But, on June 18th of this year, Good Credentials ran in the fifth race at Hazel Park in Michigan for a $4,000 claiming price. The gelding finished sixth, nearly ten lengths behind the winner. His entry caught the eye of several people, including Jennifer Wirth, a lawyer and founder of One Last Race, a non-profit that raises and distributes funds to Thoroughbred aftercare organizations. 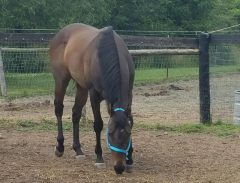 Gail spoke with Kelly Spanabel, whom she had known for years and worked with in the past to help rehome horses. Kelly offered to speak with the horse's trainer, Ernesto Scarpetta, to let him know that Beyond the Roses would be willing to take in the aging gelding if he were inclined to retire him, but the trainer declined. That was Plan A and it was a fail. Gail moved onto Plan B, which was to contact the horse's owner about retiring him, but she too declined, stating that she loved the horse and wanted to run him a few more times before retiring him. 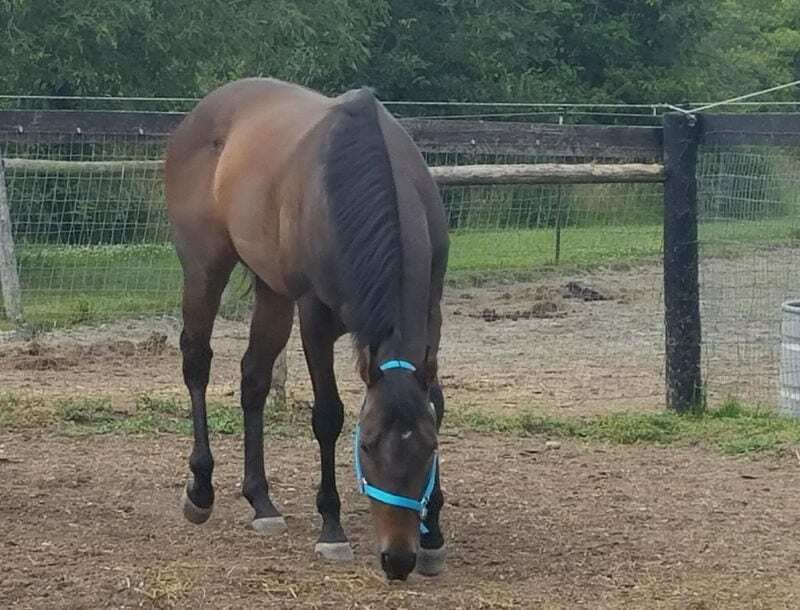 “I do think she loved the horse, but I believe she had a different opinion of what was in his best interest than myself, Jennifer, and the rest of us did,” said Gail. Gail needed a new plan. She was in the shed row of Kelly and her longtime partner, trainer George Iacovacci, hoping they might have some insight or ideas about the situation. George and Kelly were of the same opinion that the horse should not be back at the races after such a lengthy layoff and at his advanced age. “I know the horse's prior connections. Five years ago, his trainer retired him to be a riding horse. He wanted to make sure he had a good life after racing,” said Kelly Spanabel. The group felt that something needed to be done and it looked like claiming him was the way to do it, but the question of how to pay for it was a big one. “I cannot in good conscience take four-thousand dollars, which to us is a large sum of money that can sustain our herd for some time, to pay for a claim for a single horse – it is against our policy for how we use our funds,” Gail said. Little did they know, but George and Kelly's son, Fredrick, had been listening intently to the conversation and developing a plan of his own. “I'll claim the horse,” said Fredrick, who has amassed roughly $15,000 dollars in winnings from Finn B Cool in 2016. The words hung in the air for several seconds. As the trio grasped the reality of what the 12-year-old was suggesting, he explained his reasoning, stating that maybe if the horse can be recuperated and retrained, he could even eventually be sold as a riding horse, as the family does with many of their own horses. It was a business decision as much as an ethical one. “He went on to explain to us that he had made some money with his racehorse this year and he would like to use some of it to help a horse in need of being helped,” said Gail. And with that, the group had their Plan C.
On July 2, 2016, Good Credentials went to post in the second race at Hazel Park, a $4,000 claiming event going four furlongs for 3-year-olds and upward which had not won a race in 2015 and 2016. He was the oldest of six horses by several years and finished fourth by just under ten lengths. There was a lone claim submitted for the race. As Good Credentials crossed the wire that day, the claim was validated and he became the property of Fredrick Ryan Spanabel – who was the same age as the horse he'd just bought – with his father, George A. Iacovacci listed as the new trainer of record. Fredrick and his father took possession of the horse when he came back after the race and the family was celebrating with hugs, high fives and photos. Rumors quickly began circulating that Good Credential's former connections were going to lodge a formal complaint with Hazel Park's stewards to contest the claim. The hearing took place in front of the Hazel Park Stewards on July 8th and lasted roughly an hour. George appeared with Jennifer Wirth as his representative. Prior to the hearing, Wirth visited the stable to talk to the family. She also got the grand tour of Fredrick's menagerie of patients – animals he has found or people have brought to him that need help. “This kid is awesome. He's running a critter rescue out of the stable, taking care of pigeons who break their wings or a raccoon who lost its mom. He feeds them and nurses them back to health and they love him. It's really cute,” said Jennifer. When the hearing began, Fredrick, Kelly and Skylar waited outside in case the stewards wanted to call them as witnesses. Wirth wanted to make sure all parties were available for questioning. The stewards asked George questions about the motivation and validity of claim, and why, of all of the horses at Hazel Park and elsewhere, some of which are 12 years old or even older and still racing, his client/son chose to claim this particular horse. “George explained to them that he and Kelly teach their children to be kind and respectful to animals and find their best use. This horse was retired five years ago for a reason. In his and his owner's/son's opinion, Good Credentials was not fit to race. He may well be ideal for, and from a business standpoint, even someday hold increased value for a different use,” said Jennifer. The steward's decided that, based on the information and testimony given, the claim was legal and would be upheld. The MGCB reviewed and denied a horse claim challenge following a July 2 claiming race at Hazel Park Raceway. Stewards held a hearing July 8, and the horse's former trainer was served with their decision upholding the claim July 12. The former trainer has 10 days to appeal the stewards' ruling. The 12-year-old horse, Good Credentials, was entered in the July 2 claiming race. “The stewards did an excellent job,” said Jennifer. “The majority of the stewards' questions focused on what Fredrick intended to do with the horse, where the horse was currently located – they were very concerned about the well-being of the horse. To ensure the horse would never run again, part of the stewards' ruling was that George and Fredrick will fill out the Permanently Retired from Racing paperwork with The Jockey Club, which they are happy to do. After the hearing, it was back to work for George and his family, as they had five horses running that weekend at Hazel Park, including Fredrick's filly, Finn B Cool. With his mom in the saddle and his dad by his side, Fredrick cheered his filly to a 3/4-length victory on July 9, which added just over $3,000 – the winner's share of the purse – into his owner's account. As for Good Credentials, he is enjoying his second retirement at the farm of Gail Hirt. 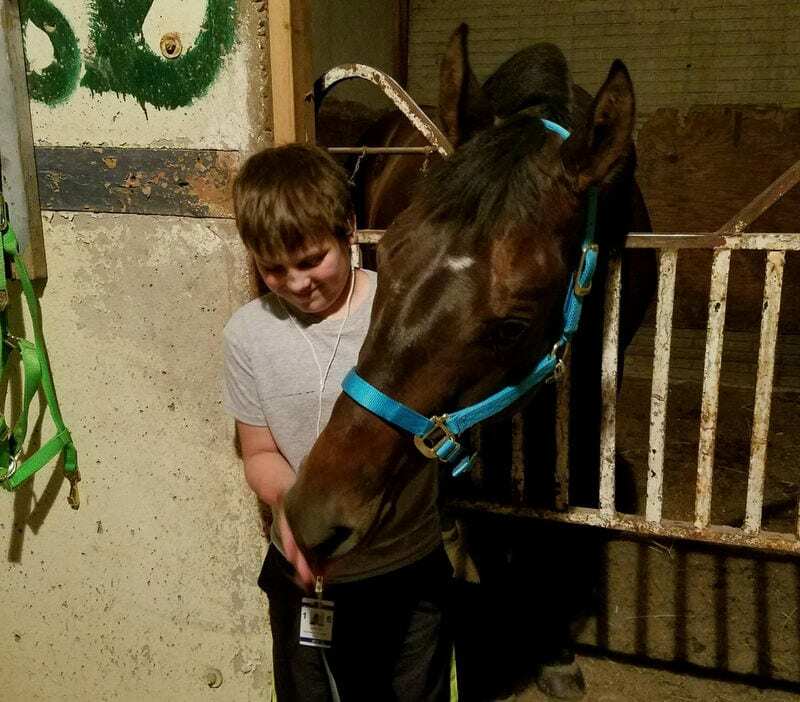 Hirt, in an effort to help the boy, has allowed him to let the horse down from racing at her stable. Fredrick is looking forward to playing a part in the retraining process with Good Credentials when the time comes. This entry was posted in Aftercare Spotlight, Horse Care and tagged Aftercare Spotlight, equine welfare, Fredrick Spanabel, Gail Hirt, George Iacovacci, Horse Racing, Horse Welfare, Jen Roytz, jennifer wirth, Kelly Spanabel, Thoroughbred aftercare, thoroughbred racing, thoroughbred rescue, thoroughbred retirement by Jen Roytz. Bookmark the permalink.